Stained glass windows a fabulous addition to any home in or around Salt Lake City because of their versatility. Any number of textures, styles, and sizes so, make them very accommodating to modern homeowners needs. Another reason for their widespread accessibility is the myriad of installation method choices. This makes them super easy to customize to any part of a home and that is something our past clients loved. Below we have listed our own insight about different installation methods to aid you in figuring out which one is right for your Salt Lake City home. As mentioned, there are many different stained glass installation methods and finding the right one for you is really about what you are trying to achieve. These methods range from very simple (and done in one day) to more difficult and extensive. 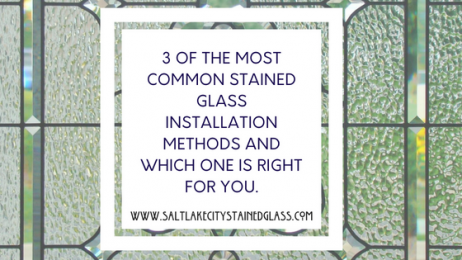 However, the one thing that is obvious–regardless of which method you choose, Salt Lake City Stained Glass excels at it! The bonding method is easily the most widely used techniques in stained glass installation. Simple, quick, and clean: it is an option for any window under 4ft. The process is straightforward and involves a custom stained glass panel(s) being applied to your home’s window. This no-frills, easy installation method is fast and always stunning. Not only does it look good from the inside and out–it has the added benefit of little extra protection from the solid glass pane. Another popular method is the triple pane method. This application is excellent for areas that get excessive moisture or need to meet safety glass building codes (i.e. new construction). In this method, the stained glass is sandwiched and sealed between two tempered pieces of glass. This keeps all moisture out and stops any condensation inside the glass. It is safe and easy to clean and our clients just love it for bathrooms. The final stained glass application method is called hook hanging. This is when we create a custom stained glass panel in our studio that is fitted with hooks on the outer edge of its frame. It can then be hung on a wall, in front of a window or free suspended. This is the best idea for Salt Lake City homeowners who plan to move their panel. If you have any additional questions about stained glass installation methods, contact us today!